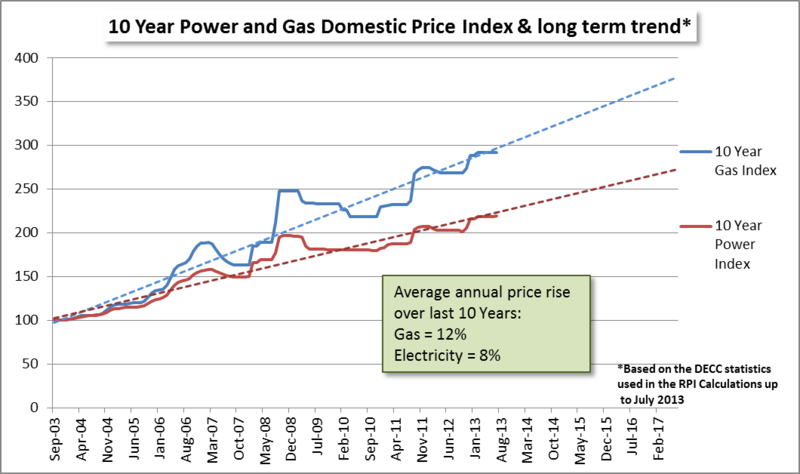 The latest round of price rises from NPower, British Gas and SSE are hardly surprising when considered in the context of the long term trend so far (see Figure 1). Indeed you would have received pretty ropey odds from your local betting shop if you had wanted a small wager on whether price rises this year would (a) happen and (b) occupy a level between 8% and 12%. Here at MyUtilityGenius we are running a virtual hedge book to try and replicate the costs a domestic supplier faces in the wholesale electricity markets for their standard variable product. You see it here in Figure 2 indexed to January 2010. This would indicate – bearing in mind that it is only a rudimentary (and therefore general) approximation of a supplier’s fundamental pricing and trading position – that wholesale power prices as faced by the supply businesses have gone up by approximately 3% in 2010 terms since the last price rise in Autumn 2012. 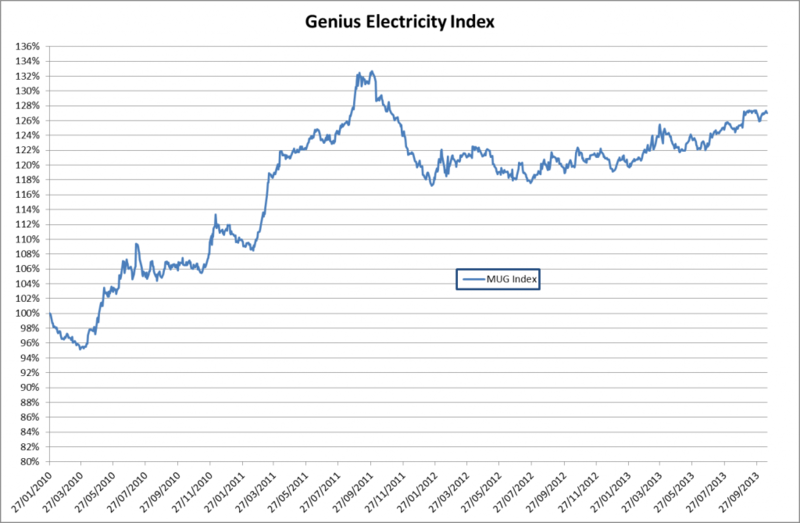 Whilst the Genius Index undoubtedly suggests a price rise it cannot account for the 8%-10% levels seen thus far in 2013 especially when you consider that the wholesale energy price only represents around 50% of the average domestic users energy bill. If I had the time and the enthusiasm, I would take a quick trundle through the various Distribution Network Operator’s Charging statements for 2012-2013; cross reference that against National Grid’s latest published rates and work out whether infrastructure could in fact be responsible for as much of the uplift (2%) as is being suggested. 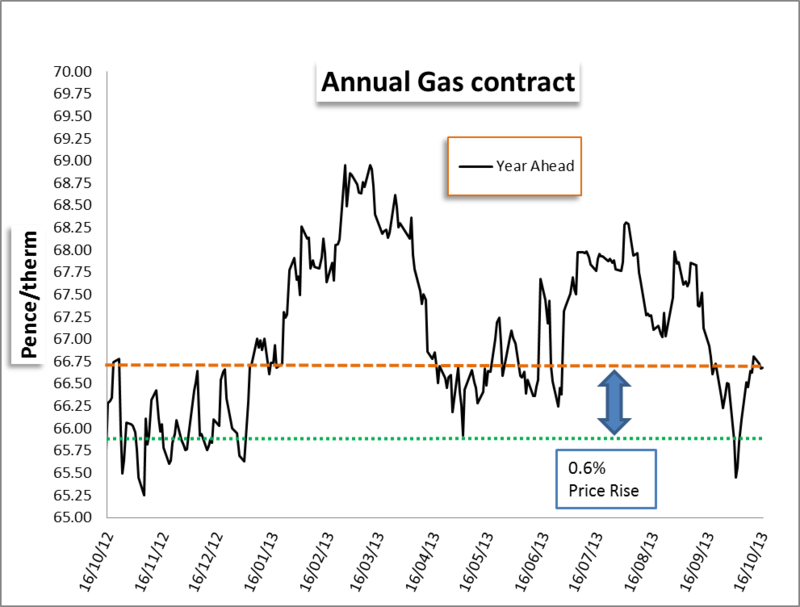 What is definitely up for debate however is whether the wholesale market is responsible for the 3% being claimed by BG overall (gas and power) given both the Genius Index and the Figure 3 which shows the year ahead price for gas has risen a whopping 0.6% since this time last year – hardly the 8% for gas claimed in the press releases I have seen. Now of course your price is only as good as your trading division so it could be that BG piled in at the height of the market back in Spring – but it is a bit of a stretch to be honest and I doubt that the traders would be too keen to stick their hand up and say they called it hopelessly wrong! Of course this isn’t only about the BG price rise; SSE have already gone – a number of the smaller players including the Cooperative have gone too and doubtless the remaining 4 big boys have their own magic number ready to spring on us once SSE and BG have taken the bulk of the bad publicity. They do not carry the costs of ECO (Energy Companies Obligations), Warm Front or many of the Government’s social welfare obligations and as a result can offer cheaper prices. They do not have a Chairman and a CEO on 7 figure salaries with boardrooms and company cars to match. They are not publicly listed which means shareholder return may not always be the beginning middle and end of the calculation. They do not have final salary pension schemes into which they pour loads of money. They are small and efficient which means they are all in the same office and can talk to each other to rectify or eliminate mistakes and improve customer communications. (I was contacted within days by both my new suppliers to confirm that my switch was in progress). Bureaucracy costs money and impacts service and, with one or two exceptions, the small suppliers really make that pay in terms of reduced costs and customer service. So; all these benefits to switching to a smaller energy supplier – not least a significant saving to the wallet – and what are we all doing? Well whatever it is it isn’t switching because 2012-13 represents an all-time low in the energy switching market with only about 15% of households switching. And yet I bet a straw poll of 100 households in the UK would bring up rising energy bills as one of the key costs causing concern to them, their friends and their family. As long as UK consumers remain apathetic in the face of these quarterly raids on their family finances; scared or unwilling to switch energy supplier; or to pay by direct debit; or to receive their energy bills online then they will continue to feel the pinch. If simultaneously we all fail to look at our own behaviours at home then we cannot really complain when we get hit with perfectly controllable cost increases. Do we really need every room in the house heated to 21 degrees C when we could be perfectly comfortable with a jumper and only the living room heated – and only to 19 degrees C? In a parallel change of emphasis the government and policy makers need to spend less time talking about price freezes and other political gimmicks; being surprised at rising energy bills (really DC, was it such a surprise? ); and more time putting a national plan of housing stock energy efficiency upgrade into motion (paid for out of general taxation if necessary). To revert to my opening question; given that energy prices have more than doubled since 2005 and yet switching rates have sunk to 15%; how much further will energy prices have to rise before the 85% finally decide that the water is too hot and jump out? Judging by our behaviour to date we could still be seeing little to no switching action in 2017; by which point the average household bill will have risen again; from £1,279 in 2013 (pre the price hike) to £1,910. There is something slightly unnerving about a frog allowing itself to be boiled don’t you think? *Known as the boiling frog syndrome and postulated in the 19th century by German scientists; the syndrome uses the phenomenon of boiling a frog so slowly it doesn’t realise it is dying, as an allegory for human behaviour that fails to recognise when something bad is going down because it is happening so gradually. This may also be referred to as the slippery slope or, in the case of the military, mission creep!